MONDAY, September 11: More than six million people in Florida remain without power today as the remnants of Hurricane Irma batter much of the southeastern United States. What once was a Category Five storm has been downgraded to tropical storm status, but not without leaving behind damage across much of the state of Florida and utter devastation on some Caribbean islands. Residents in much of Florida, Georgia, and South Carolina are not yet out of the woods. At last count, Irma’s wrath has claimed nearly forty lives across the Caribbean and some reports suggest up to 95 percent of buildings on the island of Barbuda. As of Monday, September 11, assessment is ongoing. Some reports have come in to the offices of Church of God Ministries, but much more assessment of our Church of God congregations on the Caribbean islands has yet to be done. The offices of Florida Church of God Ministries remain closed, but are expected to open on Tuesday. As power is turned back on and access is opened to our leaders on the ground, more information will slowly become available—thank you for your patience. A Global Strategy report released to social media on Monday offers some information. Haiti and the Dominican Republic were both spared the severe battering that Cuba received, though both experienced strong rains, wind, and some flooding. Missionary Mark Fulton and local staff sheltered in place at the hospital in St. Ard, Haiti. The hospital had some minor water and roof damage. The hospital is gearing up for post-storm illnesses. Dave Miller is monitoring news about the Church of God in Cuba. He has received the first news earlier today from friends in Cuba since the storm hit last week. The extent of the damage is still unknown, however. Given that Cuba received the full brunt of a category 5 storm, we expect to hear of significant damage. There are Church of God congregations in Antigua, St. Kitts and Nevis, and the Virgin Islands, all of which were battered by Irma. As of now, we have received few updates from the churches there. On Saturday, Ivor Davis of the Church of God in Antigua and Barbuda wrote that the church in Antigua experienced no damage or loss of life. Please continue to pray for all who have been affected by this storm; for many, the nightmare of recovery and rebuilding has only just begun. As you pray, please donate to Disaster Relief, as we anticipate considerable need in the wake of Hurricane Irma. Make a generous gift today at give.jesusisthesubject.org/disasterrelief. About Church of God Disaster Relief—In crises where an immediate response is critical for relief, Church of God Ministries advances funds in anticipation of a gracious outpouring of donations from churches and individuals. Such advances are made from a limited Disaster Relief Fund maintained by Church of God Ministries for emergency response to disaster. Disaster Relief contributions are utilized to bring relief to those affected by disasters worldwide. Give now at give.jesusisthesubject.org/disasterrelief. 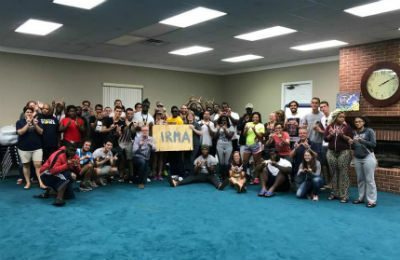 This entry was posted in All Church of God, Church of God Ministries, Colleges & Universities, Disaster Relief and tagged aid, David Hoag, Disaster Relief, DRC, Florida, Hurricane Irma, storm, update, Warner University, WU. Bookmark the permalink.